The day that began with rain was drying off by the time the Abingdon Christmas Extravaganza Parade, led by the Oxford Caledonian Pipes Band, marched round Abingdon town centre. The person the children wanted to see (as you can hear in this video above) was … ‘Santa! Santa!’ . At St Nicolas Church throughout the day, there was music and stalls, and then from 4 p.m. Tom and Jerry cartoons at the high alter with popcorn. 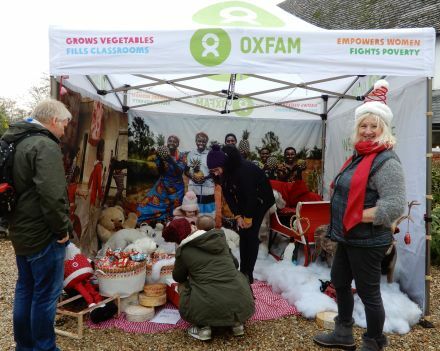 Outside St Ethelwold’s House, Oxfam has their own grotto with a backdrop of projects they support, and a lucky dip with Santa’s sleigh and reindeer. Inside they also had lots of stalls. On the Market Place, after the parade, there was a lot going on and lots of stalls. and a performance area featuring The Ox, dated 1700, that leads the Abingdon Traditional Morris Dancers. 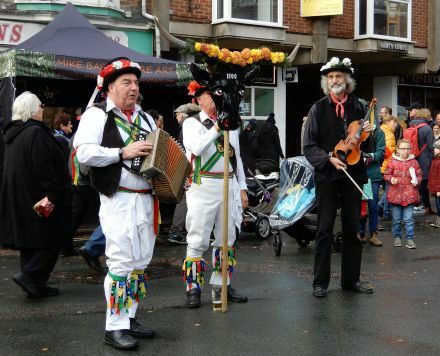 Performances also took place on the Market Place. The group pictured above are from Abingdon and Witney College who are putting on a pantomime. During the day people visited businesses in town. The event is organised by volunteers from Abingdon Chamber of Commerce, and so hopefully their members saw some benefit. Later on in the day there was something that looked like snow spraying out of the upstairs window at Beacon and Beacon. and the fireworks started, instantly. Thankyou to Julian for sending me this picture. Not all the lights came on instantly but there were people working on them throughout the day so it was best endeavours. I wish they would invest in a new improved PA system. Even near to the stage, couldn’t hear clearly. Bah Humbug! What a shame that the first comment here is a negative one, when overall the day seems to have been a great success. To redress the balance I am repeating what I said yesterday..
“Enormous congratulations to Paul, Petra and their team for another successful event. I wonder how many people realise that this is run by volunteers? Yes, they get sponsorship and grants but they have to work for those, and all the hard graft on the day – and for months beforehand – is done by volunteers. They were out there setting up in the dark – and pouring rain – in the morning probably still clearing up late into the evening. PS constructive criticism is fine, but how about combining it with a pat on the back for the good stuff? Totally agree with Hester. It was an amazing day. I was on a charity stall and we raised a lot of money as well as being able to enjoy the entertainment. Considering the heavy rain when the event was being set up (starting at 4am!) it is not surprising that there were some gremlins in the electrics. I understand that the problem with the sound was due to the switch over from a loud group to a quiet voice. I’m sure it is an issue that will be addressed at the meeting tomorrow, yes tomorrow, to start planning next year’s Extravaganza. 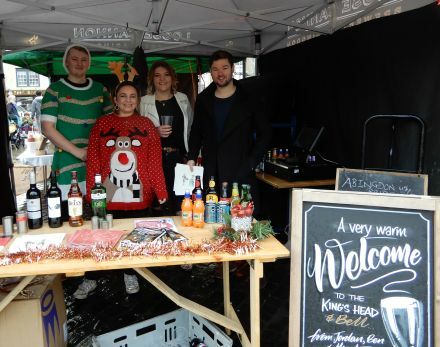 This is always a well organised event and it was great to see the shops so busy, so yes, many members of the Chamber of Commerce will have benefitted – it’s just a shame more of them do not help to organise it. It comes down to a group of around 10 unpaid volunteers to organise this, giving many hours all through the year. Well done to them. So if anyone else wants to moan about anything may I suggest they consider joining the committee, giving their time and input, and helping out. 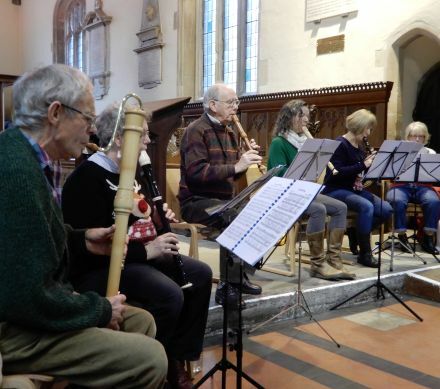 Does anyone know the name of the recorder group? I have just started to learn the treble recorder; it’s great fun trying to get arthritic fingers working! @Iain: Many thanks! I did wonder whether it was them. I will have to investigate. 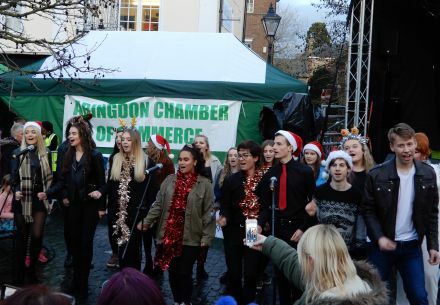 OK so the event wasn’t perfect, but I really doubt Abingdon’s traders did badly. My wife enjoyed our day in town and spent a lot in the shops in particular. Money that would have otherwise gone on-line and to the supermarkets. I’m sure we are not alone. Horsesmouth – you are exactly the sort of person my remarks were aimed at. Why don’t you come forward and volunteer/offer your ‘expertise’ and time and energy for a whole year? Everyone I spoke to on the day was praising the event. Apart from the electrical gremlins that a few criticised, they had only positive remarks. 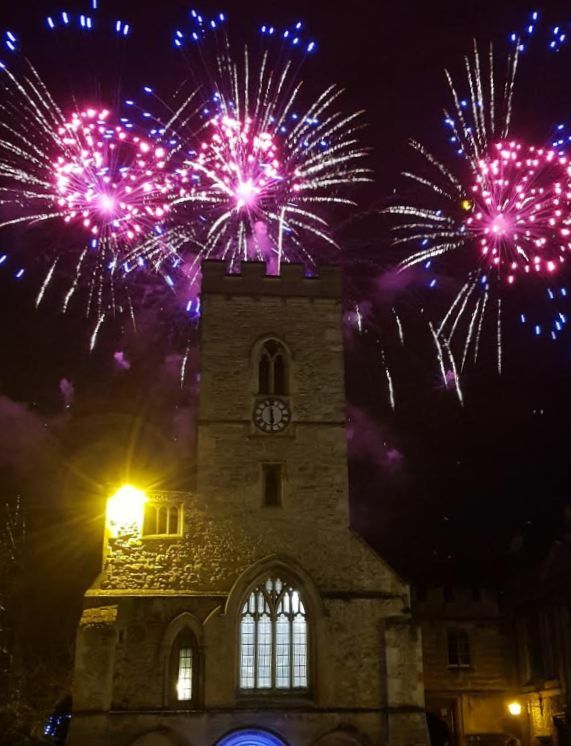 One lady had come from London to visit a friend, specifically this weekend because ‘Abingdon’s Extravaganza is better than any in London’. Yes, the parade has got smaller than in the past, but you can’t drag people or groups into it, despite numerous invitations, yet alone the enormous raft of Health and Safety issues now affecting it. A celebrity to switch on the lights? Do you know how much they cost? Even a minor celeb is thousands of pounds which is unaffordable with the budget they have, and, as you yourself say, the firework display will draw the crowds in. 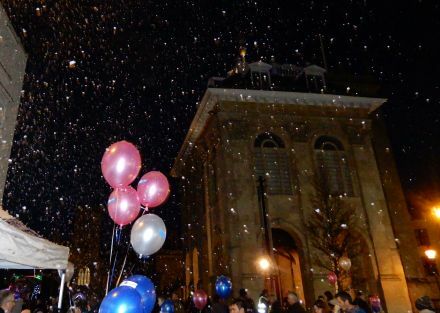 I think it is a lovey idea having a local child to do the switch on through an event which the whole community can join in and which encourages families to visit and look at the shop windows of all the shops in the town. When it was held in the evening the switch on was more like 9pm and many parents complained it was too late for young children. Any earlier and many people would be pushed to make it after work. 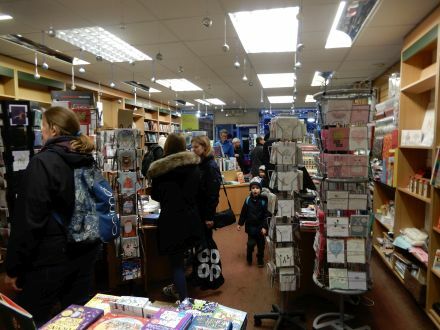 The evening event became a catch 22 situation – people stopped coming so many shops stopped opening – they wouldn’t pay their staff overtime or the extra electrical costs etc. Part of the reason for moving it to a Saturday was that the shops are open anyway and families can come for any part of the day that they wish. Most of the stalls in Bath Street were local charities trying to raise much needed money. And to describe the wares of other stalls as tack is just insulting and untrue. These are small businesses, some of which are trying to take the first step up and maybe become independent shops one day. 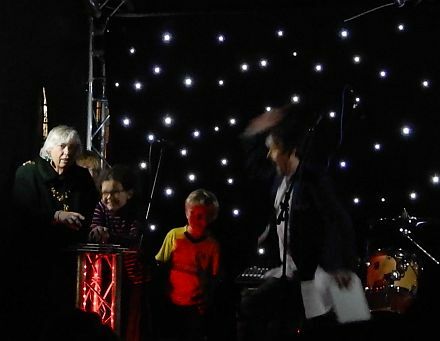 And that sums up your remarks – insulting and hurtful, to the people and businesses of Abingdon, and to the organisers – I hope they ignore them. Abingdon and the Chamber of Commerce, their sponsors and everyone else involved should be proud of this event. PS Have you seen all the POSITIVE comments on Facebook? Kelly, one of the many good things about this blog is that it’s a platform to vent ones anger and frustration, you’ve done just as I stand by my earlier comments that this event has lost its purpose and direction and I sincerely believe it should go back to its original, evening format and focus more on the towns businesses? Allow me to explain? We arrived in town at 11.45 in order to see the 1200 parade, the switch wasn’t until 1700 hrs, some five hours later, there simply isn’t enough happening to keep us there for five hours, inevitable you end up with a transient audience, those who arrive mid day and are gone not long after and those ( the majority) who arrive after 1600 hits to the fireworks, it’s too long Kelly. Backstreeter has already commented many of the lights didn’t work ( poor organisation) and those that did didn’t corespond with the lights in the precinct that were switched on a week earlier ( poor organisation) Bath st? What a shambles?an enclave of gazebos occupied by either charity organisations or one man bands selling their product, most of which was made on the kitchen table, apart from that they obscured completely the retailers shop fronts, Oliver Jones had to pin a sign on a tent saying Business as usual, the owner of Art n Things had a stand up argument with the occupiers of the gazebo outside her Shop who completely blocked her in, again, poor organisation. Little was done to engage or benefit traders in Stert st,Bridge st, east and West St. Helens or even high st, it’s lost it’s direction Kelly. Abingdon deserves better than this Kelly. You mention to about coming forward to help? That’s impossible, over the years many well meaning, constructive, innovative people have volunteered their services but they get met with the same wall of “you can’t come in” by the handful of people whose clique and inner sanctum have held back and stifled the town. Not surprisingly the protagonist morphed themselves into the Abingdon BID which after just two years was wound up after intervention by councils finance department who still haven’t managed to find out where ( let alone recover) the £200k that was compulsory collected from towns businesses, £200k Kelly gone without a trace! Abingdon deserves better than this Kelly, but that won’t hapoen until we get some new brooms! Ps, did you see the parade Kelly? Oh dear ! Bah HUMBUG!!!!! I did spend the day there, watched the parade. 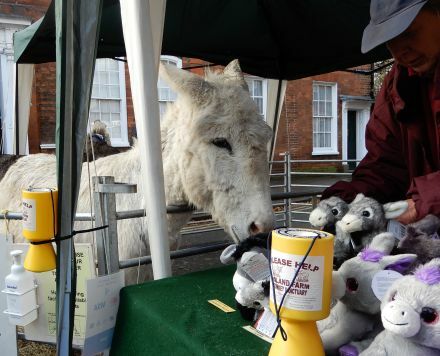 …spent money on the stalls… travelled from Botley for the switch on…So don’t bad mouth me Hester. Stood in the square,,,next year, (if I do come), will move nearer to the park. To see the fireworks alone…Standing in the square, I was not the only person to comment on not hearing Duncan at all…Is it the same PA used at the other events??. Horsesmouth you clearly have some sort of axe to grind against someone, which is vey sad. The main reason for NOT having a funfair is so that people spend their money in the shops and with the charities. I for one am glad about that. My granddaughter was happy for 6 hours, especially with the Christmas crafts in the community shop. Punch and Judy was not tucked away in a shop – they just didn’t turn up with, apparently, no warning or explanation – hardly the organisers’ fault that people are so irresponsible. I’ve no idea why you’re bringing CHAPS and the BID into this. I totally agree they were a waste of time and money, but they absolutely have nothing to do with this – totally different people, not the ’same faces’. Yes I saw the parade – admiration for those who took part, but yes, it was a little disappointing in its numbers. But, as I said before, you can’t drag people screaming into it. How would you encourage people to take part? Oh, but to answer that, you might have to offer to help or join the committee who are always open to positive suggestions and new helpers. Living in the town centre and having a different purpose for each visit, I was around the various festivities at three different times on Saturday; and what I saw each time were people enjoying themselves, people working hard and people spending money. Well done all those who helped make this possible.